Before setting the sleeves a 3/4" strip of pocketing is pressed into a curve and then basted into the armscye to prevent stretching. 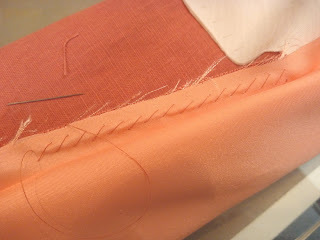 I then gathered the top of the sleeve between the notches with a long machine basting stitch. Mr Cabrera doesn't do this. Instead he bastes the sleeve into the armscye stating "Do not be discouraged if it takes two or three attempts to baste the sleeve in so that it hangs without rippling at the cap when viewed from the outside." Sorry, but I just don't have the time or the patience to do this over and over. With the cap of the sleeve gathered I basted the sleeve in place with 1/4" stitches. I then "re-basted" between the stitches. 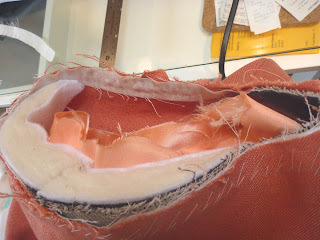 Cabrera suggests using a 1/2" seam which I agree makes things much easier. There's just less fabric to contend with. After machine stitching the sleeves, all the layers (shoulder pad, lining, pocketing, sleeve and jacket) are basted together into the seam allowance. 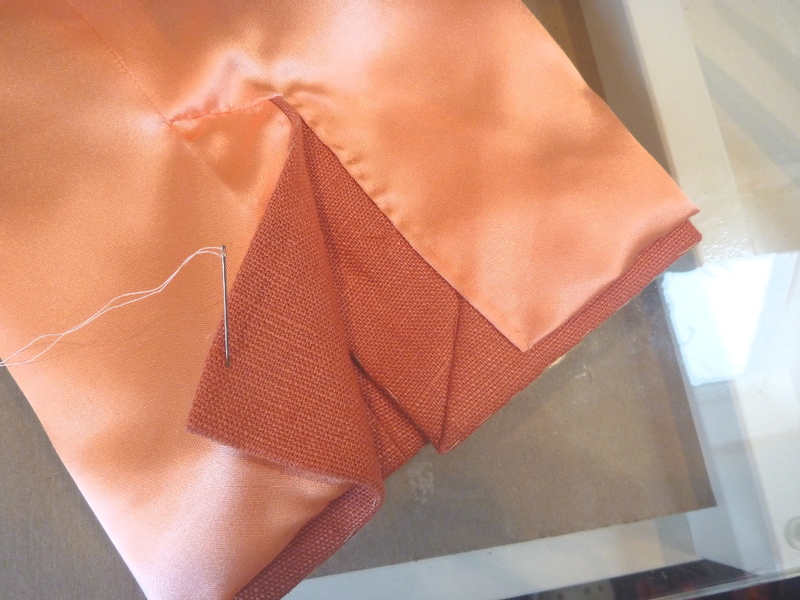 The final step is to sew a sleeve head into the seam allowance. Its job is to fill out the cap of the sleeve and to create a graceful fall of the fabric at the top of the sleeve. I'm really on the home stretch here. 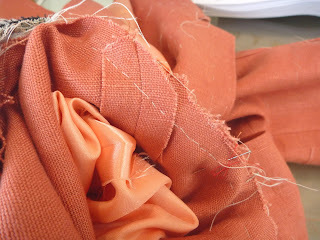 All that remains is finishing the lining, buttonholes and buttons. 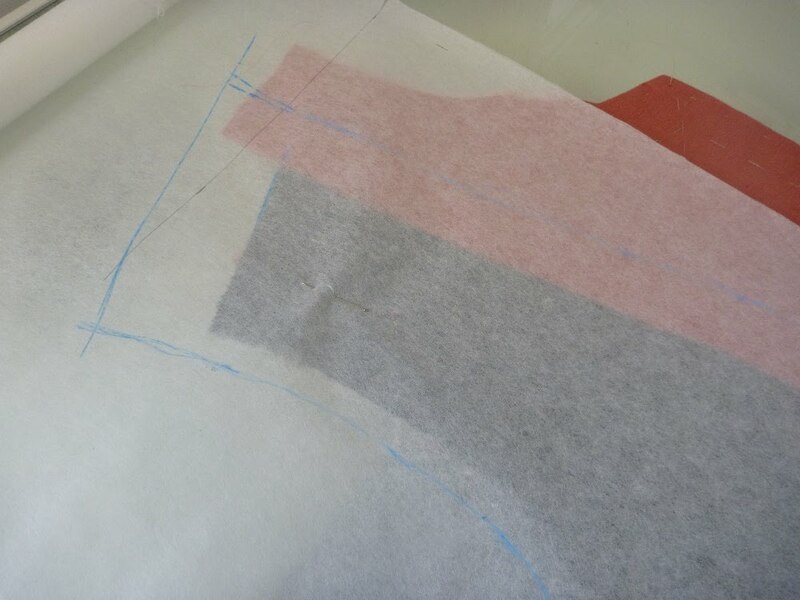 The patterns for the sleeve lining are easily made by tracing. Extra fabric is added at the vent and at the sleeve head. 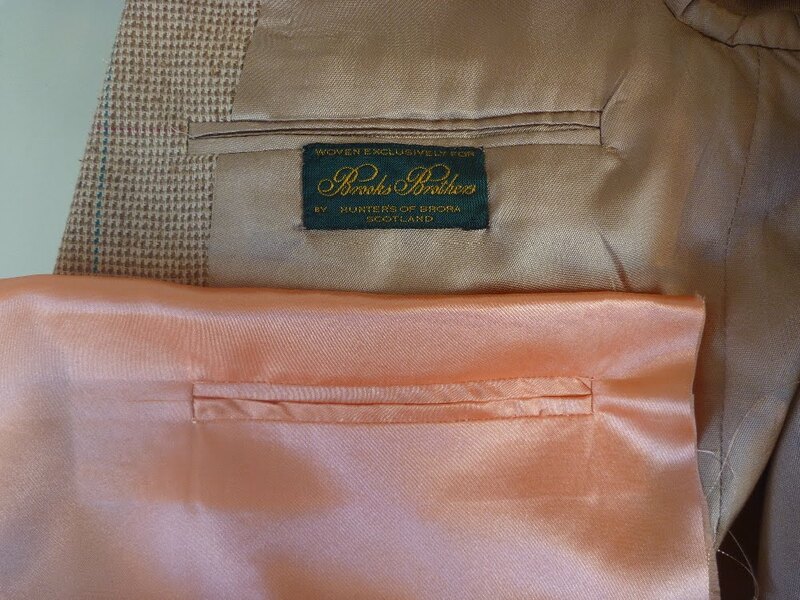 My tailors chalk from B Black and Sons makes this very easy to do. Knowing how much I hate working with lining material, the quicker and easier this job can be done the better. The seams are machine stitched (Yay! 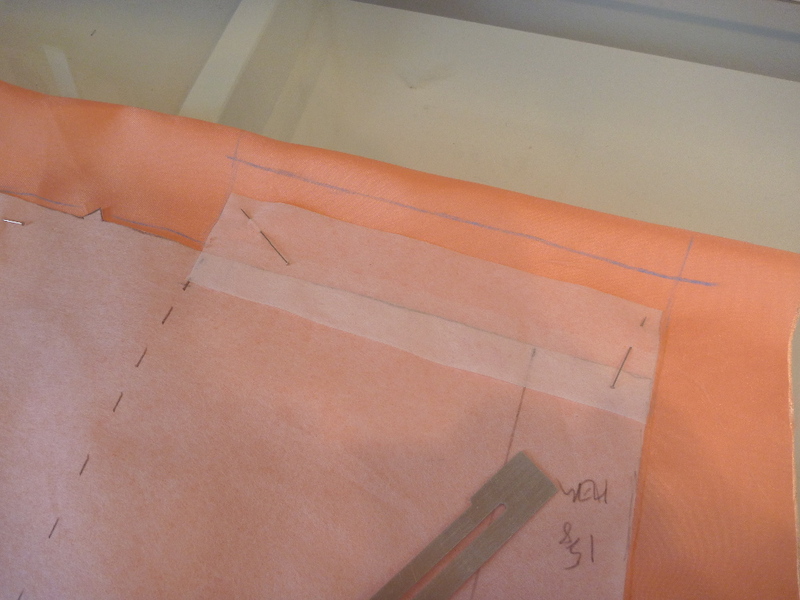 ), and then secured to the jacket seams with a diagonal stitch. 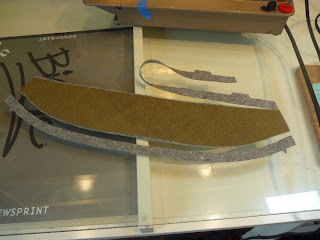 This will hold the lining in place while the jacket is put on and taken off. At the vent, the lining is slashed, folded, pressed and basted into position. The edges are finished with a prick stitch. This was all very satisfying work, and I love the deliciously luxurious feel of putting my arm in the sleeve. Now it's actually time to attach the sleeves to the jacket. Since my last post, the better part of a day was spent sewing the lining into the jacket body. There will be some detail shots later, but the process isn't really worth belaboring. I'm just glad it's done. The next step is sewing and setting the sleeves. At this point Mr. Cabrera has one draft sleeves that will fit the wearer to a T. I just don't feel that I have the skills or the time to wade through all this. Plus, I'm fitting myself, so I can't stand in front of a mirror and pin a muslin sleeve onto myself. To err on the side of caution, however, I removed one of my muslin sleeves to check that it would fit the armscye. It did, so I'm moving forward. 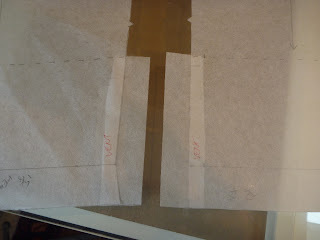 My pattern does not have vented sleeves, so I'm adding them by taping on a 1.25" by 6.5" extension to both the upper and under sleeve patterns. I also thought my muslin sleeves were a little long. I prefer to have some shirt cuff showing. So I shortened them by 3/4". This was easily done by just sewing a tuck into the Swedish tracing paper. I just love the stuff! 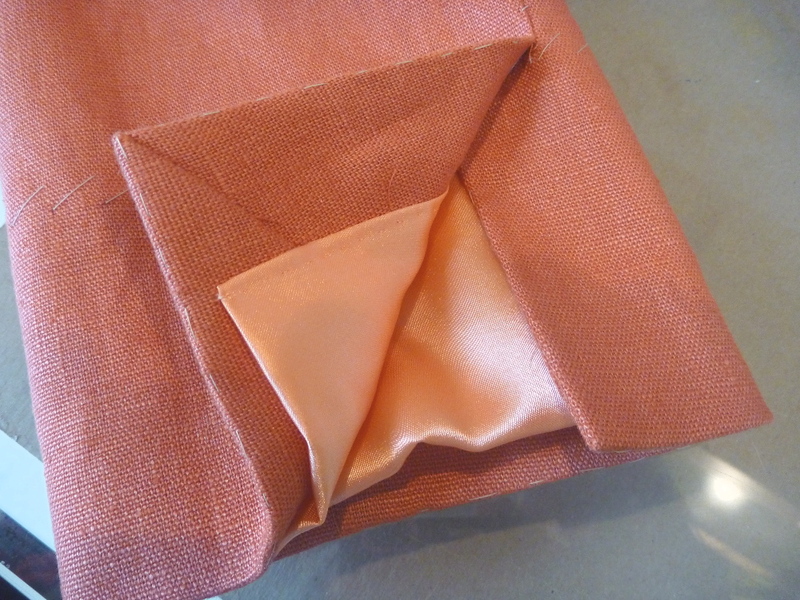 The sleeve cuffs are reinforced with a strip of bias cut pocketing material. 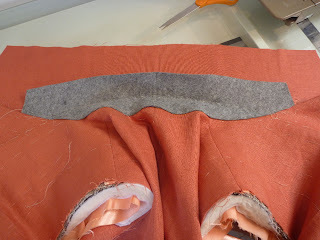 It's basted into place and then secured to the seam allowances to keep it from shifting around in the finished sleeve. The extensions are then folded, mitered and pressed into their final configuration. 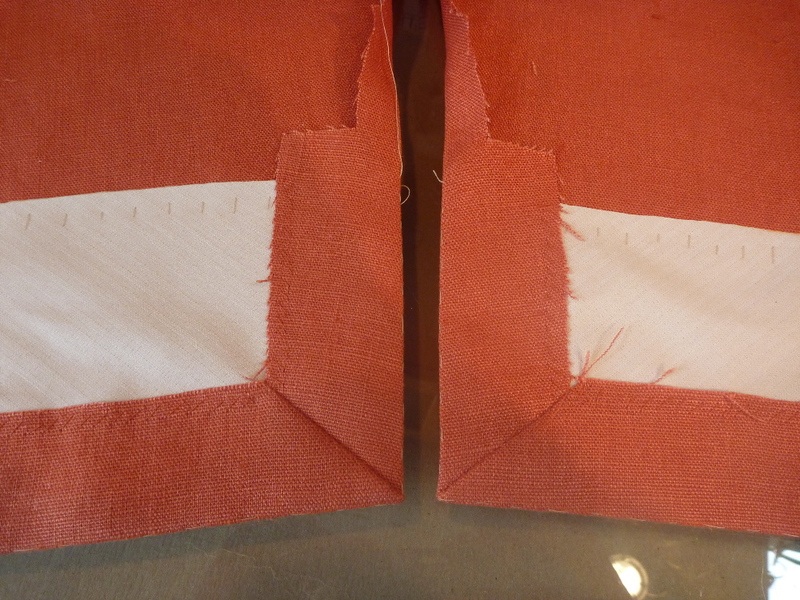 The sleeve is then machine stitched to 1/4" below the vent extensions. 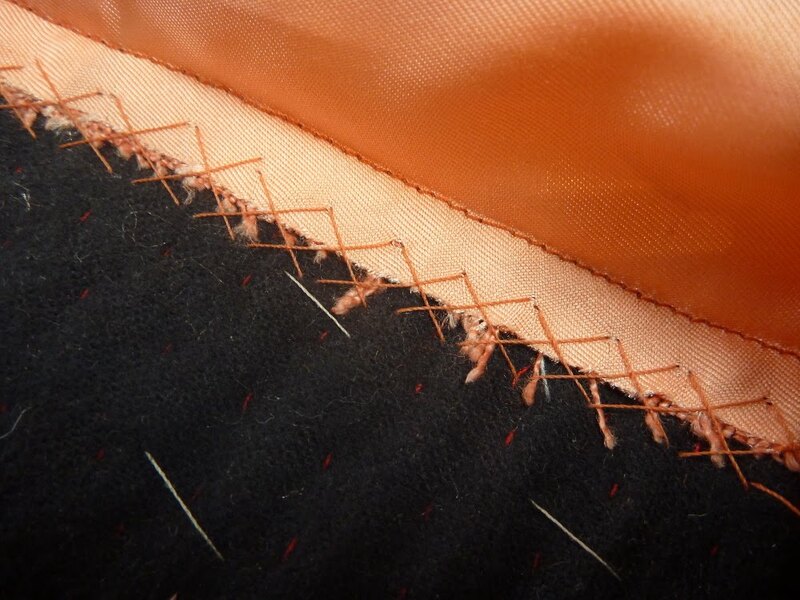 Cabrera warns against clipping the seam at the overlap. The seam is just pressed open which will create a diagonal fold. 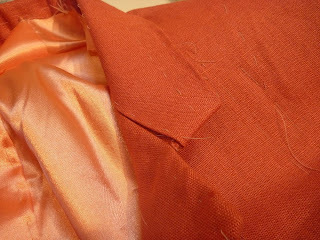 In my next post the sleeves will be lined. Patterns? We don't need no stinkin' patterns! This post is all about "collar insanity". I never dreamed the collar would be completely handsewn and created "on the fly". Here goes. Hold on. Only the undercollar pattern is used. 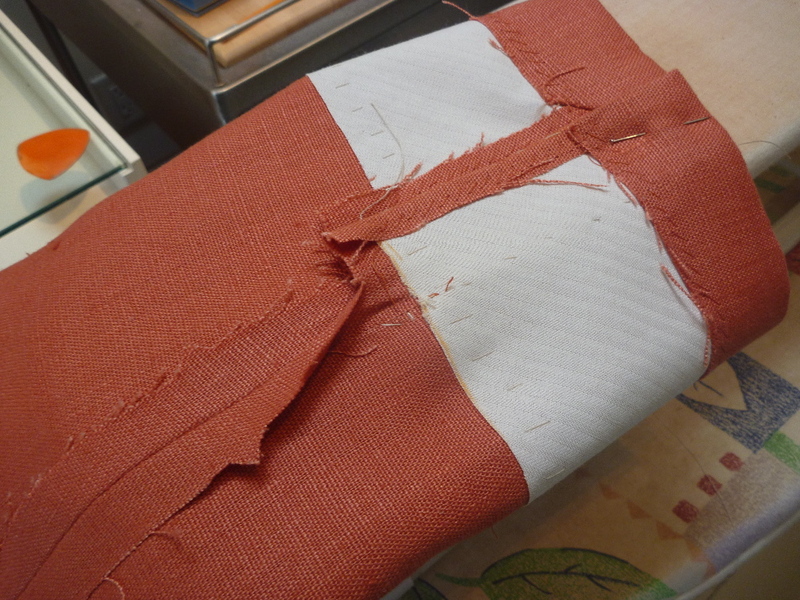 The seam allowances are trimmed off and a piece of bias cut French canvas is attached to one side. I used a fusible from Steinlauf and Stoller which worked like a charm. 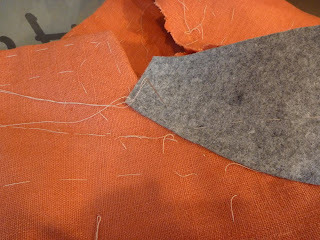 The alternative method is to pad stitch the canvas to the felt; and although I'm getting to be a pro at pad stitching, the fusible was a faster way to go. 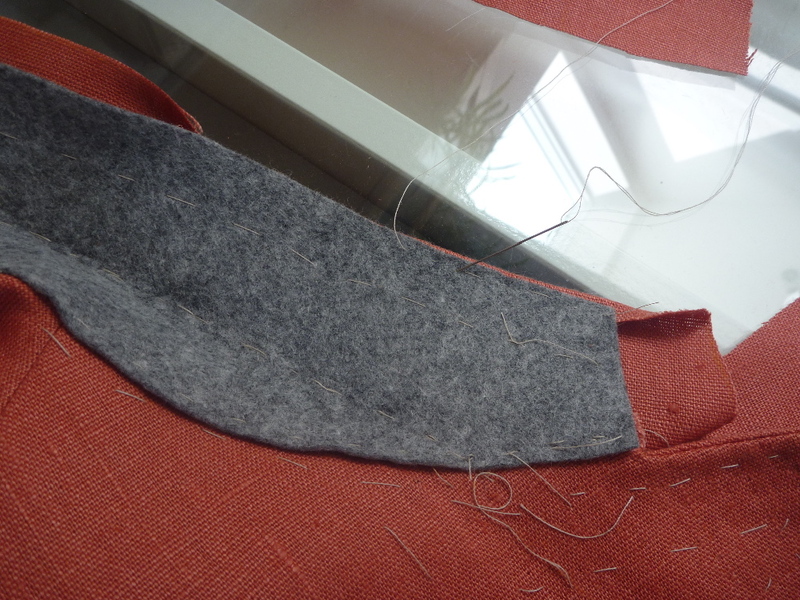 This bit is then basted to the neckline of the jacket. The next step blew me away. The top collar pattern is tossed into the trash. Instead the jacket with the attached felt is plopped onto a rectangle of the fashion fabric, and the top collar is "fabricated" by trimming and pressing it to conform to the felt. 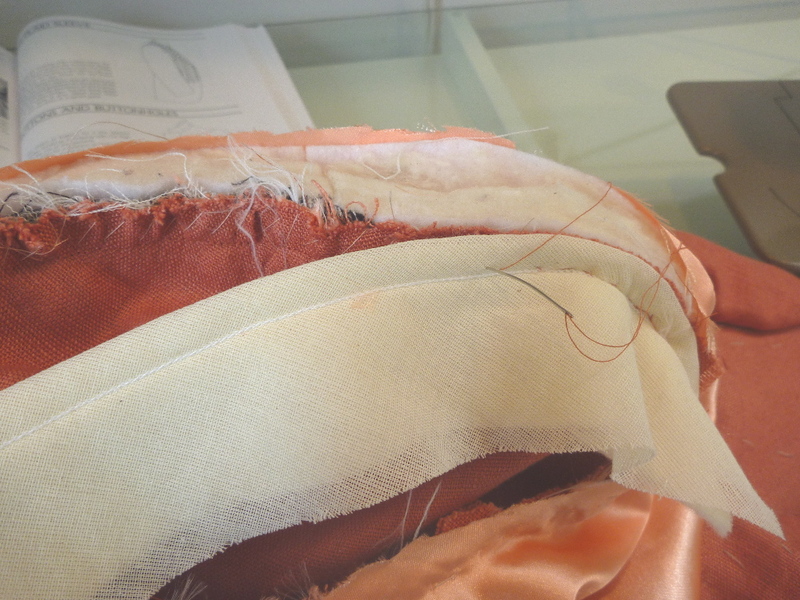 The whole construction is basted in multiple directions before finally being slip stitched together. 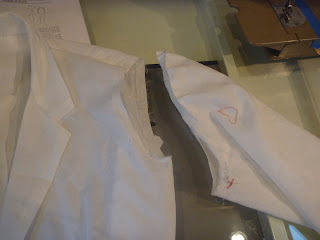 The seam between the collar and the lapel (the gore) is left open until the lining is finished. Oh boy, more poly acetate lining coming right up. The tailoring and fit of this outfit blew me away. The set of the sleeves appeared flawless. I would love to see the details of this coat up close. I've regained my composure after the lining fiasco, and I'm soldiering on. 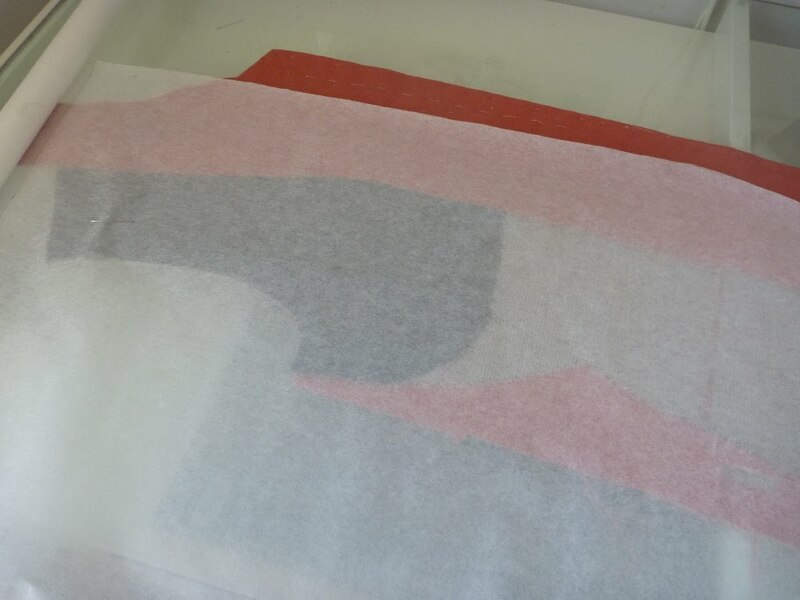 Getting out the Swedish tracing paper is where I should have started in the first place. I've laid it over the jacket front and drawn a new pattern. I actually went back to my old "gal pal", Edna Bishop to do this. 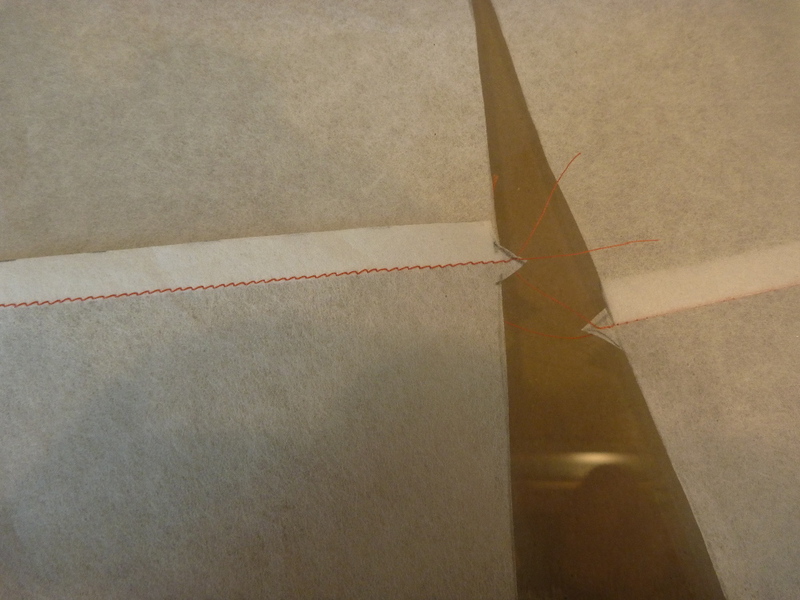 The cutting line where the lining attaches to the facing is 1.25 inches beyond the edge of the facing. 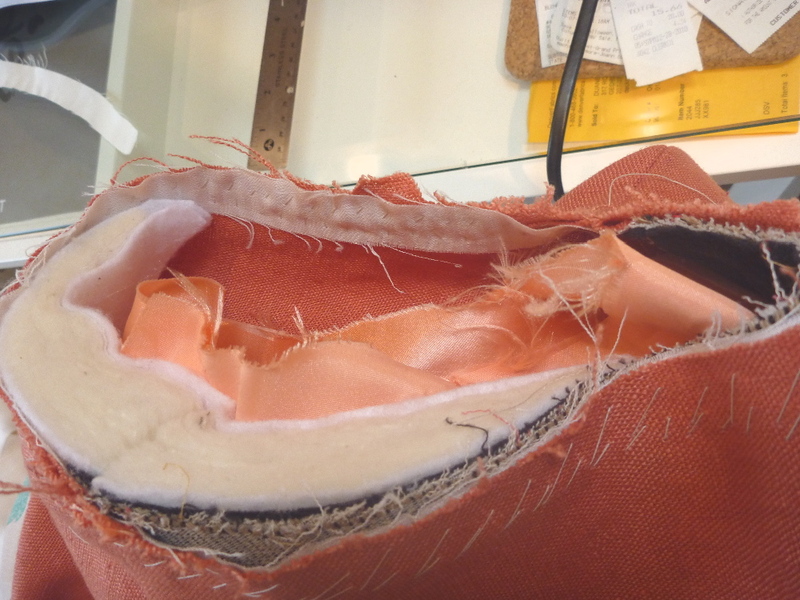 This will allow for a 5/8" seam. 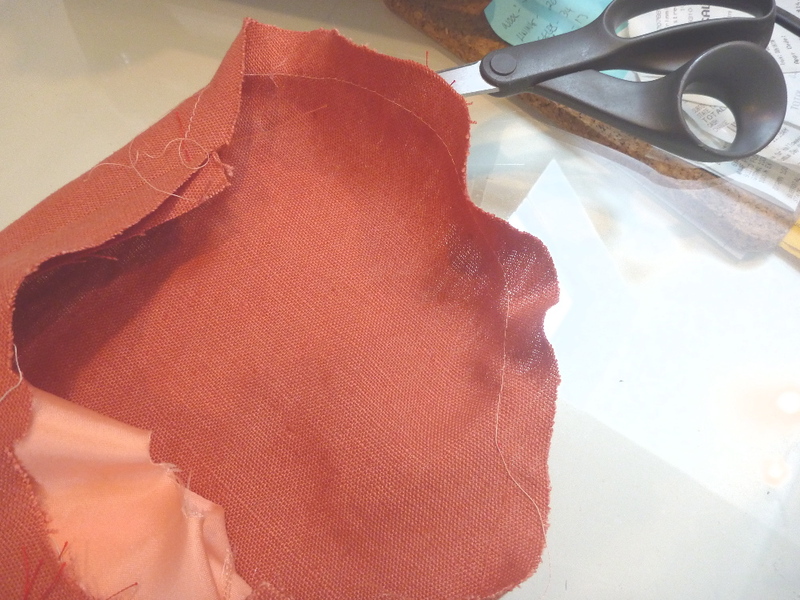 The pocket was slightly less time consuming the second time around. I'm showing it next to a Brooks Brothers pocket. Not too shabby, I say. The seam allowance of the lining / facing is then cross stitched onto the underlying canvas to secure it in place. 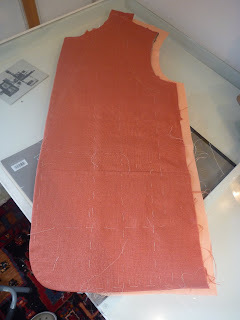 There is now plenty of extra lining for the side seams. I think it's time to move on to the back.